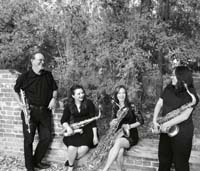 Ensemble Bio: Quartetto Obrigado was formed in 2013 as an enthusiastic group of Louisiana based saxophonists that enjoy coming together to perform new music for saxophone quartet. They have performed at NASA conferences in Illinois, Texas, Georgia, and at the 17th World Saxophone Congress in Strasbourg. In France, they premiered Ben Stonaker's Quartet No. 4 “Borderline Personalities". In October, they premiered Sunburst Carousel by Philip Schuessler at the Louisiana Music Teachers Association conference.The group is comprised of Dr. Griffin Campbell Distinguished Professor of Saxophone at Louisiana State University, Taylor Barbay Assad, professor at Nicholls State University, Jennifer C. Foret, Gifted and Talented Music Teacher in Slidell, LA, and Brina Bourliea Faciane, professor of saxophone at Southeastern Louisiana University. Griffin Campbell Soprano Saxophone Griffin Campbell has performed throughout the US and in South America, Europe, and Asia, including p . . .
Taylor Barbay Assad Alto Saxophone Saxophonist Taylor Barbay Assad is currently the Adjunct Professor of Saxophone and Jazz Ensemble at . . .
Jennifer C. Foret Tenor Saxophone Jennifer C. Foret received her Bachelor of Music Education and Bachelor of Music degree from Louisia . . .
Brina Bourliea Faciane Baritone Saxophone Brina Bourliea Faciane has given recitals and performances in the United States, Canada, Italy, Cyp . . .